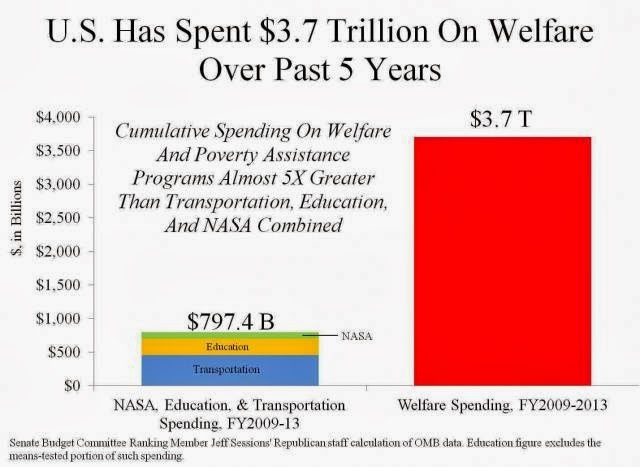 Under President Obama, the country has been run without a budget, and nearly five times as much has been spent on welfare than together on education, transportation and NASA. Read the rest of the story at CNS News. "If the government supports the people, who will support the government?" Having been granted extensions of time within which to file, the Episcopal Church (USA), its Diocese of Northwest Texas and its pseudo-Diocese of Fort Worth (never having been formally admitted into union with General Convention) have now filed motions for a rehearing of their cases with the Texas Supreme Court. The motion in the Fort Worth case may be downloaded here; the motion in the Northwest Texas (Church of the Good Shepherd) case may be downloaded here. Both motions have one ground in common: they argue that the Court's approval of the "neutral principles" approach to resolving church property disputes came as a surprise, and that applying that approach retroactively to their respective cases infringes upon the "free exercise" of their religion, in violation of the First Amendment. In addition, the motion in the Fort Worth case asks the Court, which had reversed the entire judgment below, to reinstate that portion of it which had declared that the pseudo-diocese was entitled to the name "the Episcopal Diocese of Fort Worth." The motion in the Good Shepherd case asks the Court to withdraw the portions of the majority's opinion which provided guidelines for the trial court on remand -- including the observation that the Dennis Canon was ineffective to create an irrevocable trust under Texas law. In other words, how does the Church's attempt to claim title to the property and bank accounts of departing parishes and dioceses comport with the tenets of the Christian faith? And how does the manner in which the Church claims to hold title to real and personal property amount to a form of Godly worship? The motions do not spell out exactly how the Church's free exercise of its religion has been harmed by the Court's adoption of neutral principles, and given the difficulties just referenced, that is not a surprise. But there are other inconsistencies with the argument. For instance, the Church adopted its Dennis Canon in response to the United States Supreme Court's endorsement of neutral principles in the case of Jones v. Wolf in 1979. So how can it say with a straight face that ever since it has been relying on the older deference standard? The failure of the briefs to specify just how the decision harms the Church's ability freely to exercise its religion is probably fatal to their chances of success. Making just the claim of "infringement" is not enough, but as usual, the Church simply wants its case to be presumed. The subsidiary arguments are also not well taken. In the Fort Worth case, Judge Chupp applied the deference standard, not neutral principles, in ruling that the pseudo-Diocese was entitled to the name and all the assets of Bishop Iker's Diocese. Asking the Court to preserve part of that ruling, when the Court has announced that the deference standard is no longer applicable, makes no sense. As for the Diocese of Northwest Texas, it has little to complain about in the minimal guidance offered by the Supreme Cour to the trial court following remand. The law of Texas is what it is with regard to revocable trusts, and the Court did not break any new ground in what it opined. Moreover, there were four dissenters, out of the nine total on the Court. Who can say that the same lineup will recur if and when the case ever comes back to it? The Court will not grant the motions without first asking the prevailing parties to file a response. But it does not have to ask for any response before deciding to deny the motions outright. So stay tuned -- I will update this post as soon as the Court does anything. Our Constitution took effect on March 4, 1789; the first ten amendments (the Bill of Rights) followed in 1791. It has taken only 224 years to stand the Constitution on its head. The 1789 version of the Constitution called for three co-equal branches of government: executive, legislative, and judiciary. Each had a role to play in the government's functions, and there were an abundance of checks and balances to keep any one of them from dominating the others. The 2013 version of the Constitution has the government now dominated by its executive branch. Like Rome's Senate during the Empire period, the legislative branch stands idly by, assembling now and then to add a rubber stamp of approval to whatever the President decides to do, or not to do -- to spend, or not to spend (such as on the National Parks, during a so-called shutdown). The judiciary defers to the legislature's follies, and lets the executive branch mostly do as it pleases. What has driven this transformation? I will tell you, in just two words: paper money. 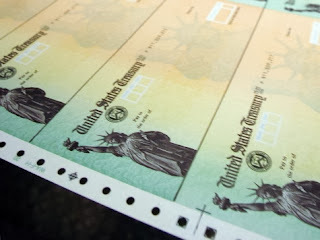 Our paper money is, as I explained in this earlier series of posts, not money, properly speaking. It is debt -- once (long ago) a promise of redemption in silver, but now (take out a dollar bill and read what it says) just a promise to be redeemed by more paper: a "Federal Reserve Note," which you can exchange only for an identical one. What kind of promise is that? One paper dollar backs another, which backs another . . . it is, to paraphrase the old joke, "paper all the way down." Take the rough numbers: $17 trillion equals $17 x 1012. There are around 300 million men, women and children in the United States, or 3 x 108 people. Divide the latter number into the former: the result is (with rounding, because we are dealing in rough numbers) $6 x 104 -- that is sixty thousand dollars per person, for every last one of us, that we owe in debt. Wrong. While we may be privileged to print paper money for the time being, the paper behind it is good only for so long as someone else will take it in exchange for goods or services. Washington D.C. seems to think that we can never run out of money, and look how right they have proved with regard to everything else -- starting with the cost of Obamacare. So we lurch from debt ceiling to debt ceiling, ever raising it, and never, ever lowering it. But now, with the latest legislation, Congress abdicated its Constitutional responsibility (Art. I, sec. 8) "to pay the Debts ... of the United States." After February 7, the ceiling will kick in again at whatever limit has been reached by then, and Congress will once again need to authorize any future increase. The expectation is that Congress will cave, however, and permanently allow the President to increase the spending level thereafter as he deems fit, subject to its theoretical power to override any veto by a two-thirds vote in both Houses. And once that happens, Congress will have relinquished its last and best control over the purse strings. Just one hundred years ago, in 1913, Congress abdicated its constitutionally-granted power to coin money (Art. I, sec. 8 again) to the Federal Reserve Bank. Since that time, the Fed has printed so much paper money that the value of the dollar in 1913 has steadily shrunk: even using the official (and rather dubitable) inflation rates, it would require $23.62 to be able to buy what you could purchase for just $1 in 1913. Never in the history of the world has the paper money phenomenon turned out differently. It always results in a devaluation, and never the other way around. The trick of the Federal Reserve has been to stretch out this devaluation over a century, so that the people from one generation to the next barely notice it. Another characteristic of the paper-money phenomenon, however, is the tendency for the rate of devaluation to increase as the currency nears the point of total collapse. And with our national debt having tripled in just the last twelve years, what do you think has been happening to the rate of devaluation? You guessed it -- and what is worse, the increase in the rate is intentional. I know what the politicians are thinking -- they hope not to be around when the entire paper machine collapses. (Just as Ben Bernanke plans not to be around when his successor has to start taking away the punchbowl.) But what are we thinking, who send such people to Washington to act for us? The country has not operated on a budget ever since Obama's second year in office. Question: how is it possible to bring deficit spending under control without a budget? Operating the government by "continuing resolution" is a recipe for continuing to operate at the same deficit as before (depending on tax revenues) -- except that now the President gets to raise the ceiling for cumulative deficits any time he wants to, so there is no downside to spending more and more. Are we, then, locked in on the current course of destruction? Not entirely -- there still will be elections every two years, and if the voters applied themselves, all those who voted to continue business in Washington as usual could be turned out. Given the media's unflagging support for the spenders, however, it will take a lot more grass-roots effort than at any time ever before. The Greeks had our number long, long ago: they had already observed that governments of the people, by the people and for the people end in ruin once they discover the ability to vote themselves other people's money. A strong figure on a white horse rides into the resulting chaos and disorder and promises to restore "good government" if handed sufficient power, and a tyranny then replaces the people's government. Ah, well -- Rome's republic lasted for 465 years. But that was then, and this is now, with the effects of every transaction greatly accelerated. Ours will be lucky to see its 250th. On October 9, 2013, Judge Thomas H. Ortbal of the Adams County Circuit Court entered a final judgment against ECUSA and its (no-longer-existent) "Diocese of Quincy". The judgment decrees and declares that the Anglican Diocese of Quincy is the sole owner of its real and personal property, including approximately $4 million in its bank accounts that has been frozen ever since ECUSA first wrote a letter to its bank in January 2009. In order to keep the funds frozen, ECUSA had filed a motion to stay enforcement of the judgment pending its appeal to the Fourth District Court of Appeals. It also filed a motion to substitute, in place of its former "Diocese of Quincy", the Episcopal Diocese of Chicago, into which the former Diocese of Quincy merged ecclesiastically effective September 1. In a separate order, also entered October 9, Judge Ortbal denied on technical grounds the motion to substitute in the Diocese of Chicago, and stayed the main judgment as to all but the real property and $1.1 million of the funds on deposit. He did not require any bond from either side. 12. There is no provision in TEC's Constitution or Canons requiring that a diocese receive approval prior to amending its own constitution or canons, nor is there anything in the provisions of TEC's Constitution which incorporates religious doctrine relating to the ownership of diocesan property which would require deference. 13. There is no explicit provision in TEC's Constitution or Canons specifying the office or body having supremacy or ultimate authority over a diocese and there is no explicit or clearly delineated expression in TEC's governing documents that the General Convention is the ultimate authority or judicatory of TEC. TEC's own expert witness, Dr. Bruce Mullin, conceded that there is no such express provision in TEC's constitution. 14 There is no express provision in TEC's Constitution or Canons prohibiting a diocese from withdrawing its association with TEC. 15. 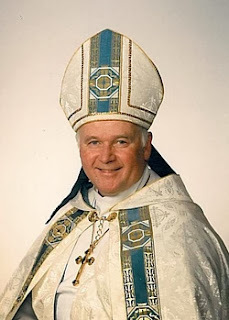 The only express statement in TEC's Constitution or Canons defining the "Ecclesiastical Authority" of a diocese such as DOQ is either the Diocesan Bishop, or in the absence of a Bishop, the Standing Committee. At the time DOQ voted to disaffiliate, the Standing Committee of DOQ was the highest ecclesiastical authority of the Diocese. In order to keep these findings from binding it (i.e., becoming res judicata, as attorneys put it) in any other case involving a withdrawing diocese, ECUSA is forced to appeal the judgment -- even if that were not its policy anyway. And that fact points up the weakness of ECUSA's strategy of litigating against each and every diocese that elects to withdraw: should any appellate court affirm a judgment with findings like those made by Judge Ortbal, and should the higher courts refuse to review that appellate court decision, then ECUSA will be subject to pleas of res judicata in any subsequent case involving a member diocese. Sec. 2. No member of the Church, whether lay or ordained, may seek to have the Constitution and Canons of the Church interpreted by a secular court, or resort to a secular court to address a dispute arising under the Constitution and Canons, or for any purpose of delay, hindrance, review or otherwise affecting any proceeding under this Title. But now the Presiding Bishop's "go it alone" strategy has resulted in a civil court judgment against the organization which does threaten to bind ECUSA and all of its member dioceses, in a way that no resolution or canon adopted by General Convention ever would. And should that come to pass -- whether in Illinois (Quincy), California (San Joaquin), Texas (Fort Worth) or South Carolina, then such a judgment will make it easy for any subsequent diocese to leave ECUSA with impunity -- all due to the workings of res judicata in the secular law (the Latin means: "the matter having been [finally] adjudged"). A party which has once litigated an issue to finality in one court may not continue to litigate that same issue again and again in other courts. The law of res judicata, it should be noted, does not work in reverse against other dioceses, because it binds only the specific parties to each proceeding. Thus if, say, the case in Pittsburgh had ever led to a final judgment saying that dioceses were not free to leave ECUSA, that holding could be cited only as non-binding precedent in another case involving a different diocese in a different State. But since ECUSA is a party to each and every diocesan lawsuit, it will be bound by the first result reached against it in any of the various lawsuits it is pursuing. And given that Quincy's is the first trial court judgment against it, the odds favor Illinois as being the State that will deliver the coup de grâce to Katharine Jefferts Schori's misguided scorch-and-burn policy of suing every departing entity, no matter which, and no matter what cost. Whether or not the Diocese of Chicago may successfully replace the former Diocese of Quincy in the appeal that ECUSA will take will also most probably be decided by the Court of Appeals. ECUSA's simple claim to Judge Ortbal that the merger of the dioceses had been approved in accordance with the Constitution and Canons of the Church did not satisfy the secular requirements for a party to be substituted under Illinois law. At common law, no unincorporated association could sue or be sued in court, because its membership was amorphous and undefined: it could change from day to day, and grow at one point and decline at another. Unlike a corporation, the association itself was not seen as a separate entity in its own right, because it existed only through its members and possessed no charter of organization from the State. Most States have changed the common law by statute, and allow associations to sue and be sued in their own name. But when an association dissolves, the question arises as to what becomes of its property and assets. Absent a decision by the membership itself in the dissolution, the law will regard each former member as possessing a fractional part of each asset, with the result that it becomes virtually impossible to trace the title of that asset subsequent to dissolution. And that is the conundrum faced by ECUSA in the Quincy lawsuit. Who is the successor, under Illinois secular law, to the property and rights formerly held by its Episcopal Diocese of Quincy? If it is the Episcopal Diocese of Chicago, just how did the transfer of those assets take place by operation of Illinois secular law, as opposed to ecclesiastical law (generally unenforceable in the secular courts)? Your Curmudgeon is personally involved in these issues, so please take everything I say with a certain grain of salt. Only time will tell if my opinions are correct. But what we are seeing could be the beginnings of an unraveling of ECUSA's flawed litigation strategy.